Objective International guidelines recommend the use of dual antiplatelet therapy (DAPT) after transcatheter aortic valve implantation (TAVI). The recommended duration of DAPT varies between guidelines. In this two-part study, we (1) performed a structured survey of 45 TAVI centres from around the world to determine if there is consensus among clinicians regarding antiplatelet therapy after TAVI; and then (2) performed a systematic review of all suitable studies (randomised controlled trials (RCTs) and registries) to determine if aspirin monotherapy can be used instead of DAPT. Methods A structured electronic survey regarding antiplatelet use after TAVI was completed by 45 TAVI centres across Europe, Australasia and the USA. A systematic review of TAVI RCTs and registries was then performed comparing DAPT duration and incidence of stroke, bleeding and death. A variance weighted least squared metaregression was then performed to determine the relationship of antiplatelet therapy and adverse events. Results 82.2% of centres routinely used DAPT after TAVI. Median duration was 3 months. 13.3% based their practice on guidelines. 11 781 patients (26 studies) were eligible for the metaregression. There was no benefit of DAPT over aspirin monotherapy for stroke (P=0.49), death (P=0.72) or bleeding (P=0.91). Discussion Aspirin monotherapy appears to be as safe and effective as DAPT after TAVI. Periprocedural stroke is a well-recognised complication of transcatheter aortic valve implantation (TAVI). Post-TAVI antiplatelet therapy is routinely employed in an attempt to mitigate the risk of stroke, with a cost of increased bleeding complications. There is a paucity of data available to inform optimal antiplatelet strategy after TAVI and this is reflected in uncertainty within published guidelines. This study presents data demonstrating the heterogeneity of real-world practice with regard to antiplatelet prescribing in TAVI. By synthesising the available evidence, we demonstrate in a meta-analysis of 11 781 patients that dual antiplatelet therapy (DAPT) after TAVI confers no benefit beyond 1 month in terms of stroke rate, overall mortality or major bleeding. Aspirin monotherapy may therefore be a sufficient antiplatelet therapy in the post-TAVI period. This study provides the most robust evidence to date advocating a more conservative approach to antiplatelet therapy following TAVI. These data may be used to unify clinical practice and reduce exposure to the potentially harmful effects of DAPT in this vulnerable patient population. Transcatheter aortic valve implantation (TAVI) has been demonstrated to be superior to medical therapy in patients in whom surgical aortic valve replacement (AVR) is deemed too high risk.1 The use of TAVI continues to increase2 and, due to its success in high-risk patients, its role in intermediate-risk patients is being assessed.3–5 One of the most feared complications of TAVI is stroke. The incidence of periprocedural stroke varies from 1% to 11%.6 To mitigate the risk of stroke, dual antiplatelet therapy (DAPT) is prescribed periprocedurally and for a period of time after the procedure. The optimal duration of antiplatelet therapy post-procedure has not been convincingly defined. European7 and American8 9 guidance differs. Additionally, different valve manufacturers suggest different durations of DAPT post-procedure and the randomised studies that have established TAVI also use varying durations of DAPT.1 10 Finally, little prospective randomised data have been gathered to definitively answer this question. Unfortunately, while helping to mitigate against stoke, DAPT is also associated with an inevitable increased risk of bleeding complications which can cause significant morbidity and mortality.11 12 The risk of bleeding complication appears to be most acutely related to patients’ age, gender, renal function and frailty.13 14 The majority of patients in the ‘high-risk’ TAVI group also fall into the category of being at ‘high risk’ for bleeding complications from DAPT. Defining the minimal duration of DAPT, which reduces stroke risk while minimising the risk of bleeding complications, is therefore important to minimise adverse events in this population. In this two-part study, we first performed a structured survey of 45 TAVI sites to determine their preferred antiplatelet regimen and then performed a systematic review of the literature, meta-analysis and meta-regression to determine if there is an optimal duration of DAPT, and the role of aspirin monotherapy following TAVI. Up to 298 TAVI centres were identified worldwide using a TAVI implanters registry. An online structured questionnaire was issued to each centre to establish current practice with regard to DAPT. The duration of DAPT used, and the reasons why this was preferred, were ascertained. A copy of the original questionnaire is available in online supplementary appendix 1. We performed a systematic search of the MEDLINE, Cochrane and Embase databases (from 2006 to March 2017) for all studies of TAVI. Our search strings included ‘Transcatheter Aortic Valve Implantation’, ‘Transcatheter aortic valve replacement’, ‘antiplatelet’, ‘aspirin’, ‘clopidogrel’ or ‘antithrombotic’. Bibliographies were hand-searched for relevant studies, reviews and meta-analyses to identify further eligible studies. Abstracts were reviewed for suitability and articles were accordingly retrieved. The search and meta-analysis were performed in accordance with published guidance. We considered all studies of TAVI. Studies were eligible if they reported mortality, stroke, bleeding and the antithrombotic regimen after TAVI. Both observational studies and randomised controlled trials (RCTs) were identified. We excluded studies of the transapical approach due to the inherent increased risk with this approach.15 16 We excluded animal studies, case reports, conference abstracts, meta-analyses and reviews from the final selection. The primary endpoints were stroke, all-cause mortality and major bleeding, and outcome data regarding these were extracted from the included studies. The duration of DAPT was also extracted for each included study. We carried out a meta-analysis of TAVI studies, in accordance with published guidance.17 These data were synthesised and meta-analysed using inverse-variance weighting and the Restricted Effects Maximum Likelihood (REML) method to provide a pooled estimate. A mixed-effects metaregression was then performed to determine the relationship of antiplatelet therapy and duration to adverse events by including DAPT duration as a continuous moderator and study arm as a random effect. Heterogeneity was assessed using the I2 statistic.2 18 Mean values are expressed as mean±SD unless otherwise stated. An unpaired t-test was used to compare between group data. The statistical programming environment R19 with the metafor package was used for all statistical analyses. Forty-five TAVI sites across 12 countries participated. There was a breadth of experience in respondents: 33.3% had performed >200 cumulative procedures, 31.1% had performed 100–200 procedures and 35.6% had performed <100 procedures. 42.2% reported that their antiplatelet therapy policy was based on operator preference, 44.5% on local institutional policy and 13.3% on national and international guidelines (figure 1A). Only 11.1% reported adjusting antiplatelet therapy according to valve system used. Results of structured survey of 45 TAVI centres. Panel (A) shows the basis behind decisions made for antithrombotic treatment after TAVI; panel (B) shows antiplatelet loading regimens before TAVI; panel (C) shows longer term antiplatelet strategy after TAVI. DAPT, dual antiplatelet therapy; TAVI, transcatheter aortic valve implantation. Pre-TAVI loading regimens were variable (figure 1B): 40% were loaded with aspirin monotherapy, 6.6% were loaded with clopidogrel monotherapy and 24.4% were loaded with aspirin and clopidogrel. Twenty-nine per cent of centres did not load with any antiplatelet therapy. Antiplatelet therapy after TAVI was similarly variable (figure 1C): 82.2% reported using DAPT with 17.8% using monotherapy. Overall, 46.7% used 3 months, 22.2% used 6 months, 4.4% used 1 month and 2.2% used 12 months of DAPT therapy. In patients on long-term oral anticoagulation (OAC) 44.4% used antiplatelet monotherapy, 20% used DAPT and 35.6% did not use additional antiplatelet therapy. Duration of concomitant antiplatelet monotherapy in patients on OAC after TAVI was variable: Aspirin for 1 month was 15%, 3 months 10%, 6 months 10% and long term 20%; clopidogrel for 1 month was 10%, 3 months 20% and 6 months 15%. A total of 11 781 patients (26 studies) were suitably identified for inclusion3 10 20–44 (figure 2). 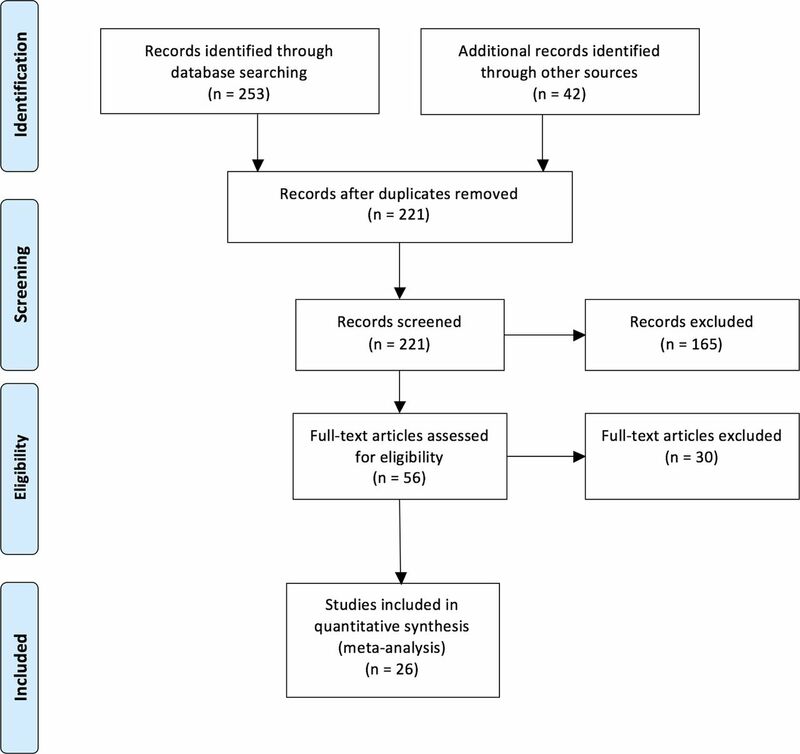 Preferred Reporting Items for Systematic Reviews and Meta-Analyses (PRISMA) flow chart showing the search strategy for the systematic review, meta-analysis and metaregression. Characteristics of included studies are shown in online supplementary appendix 2. The meta-analysis of mortality showed an overall all-cause mortality rate of 11% (95% CI 8% to 15%, P<0.001; I2=91.5%, P<0.001 for heterogeneity). The meta-analysis of stroke showed an overall stroke rate of 4% (95% CI 3% to 6%, P<0.001; I2=65.8%, P<0.001 for heterogeneity). The meta-analysis of bleeding showed an overall rate of major bleeding of 11% (95% CI 6% to 17%, P<0.001; I2=96%, P<0.001 for heterogeneity). All outcomes are at time to last follow-up across all studies. Mixed-effects meta-regression was performed using DAPT duration as a continuous moderator and study as a random effect. Metaregression showed no significant interaction between DAPT duration and mortality (figure 3, β=0.02; 95% CI −0.09 to 0.14; P=0.72; I2=96.7%; P for heterogeneity <0.001), stroke (figure 4, β=0.04; 95% CI −0.08 to 0.17; P=0.49; I2=64%; P for heterogeneity <0.001) and bleeding (figure 5, β=−0.02; 95% CI −0.27 to 0.24; P=0.91; I2=97%; P for heterogeneity <0.001). Metaregression showing the relationship between mortality and antiplatelet strategy. The x-axis shows DAPT duration, including aspirin monotherapy on the far left (blue panel). The y-axis shows the incidence of mortality. Individual studies are represented by circles, with study size weighting giving varying sizes. 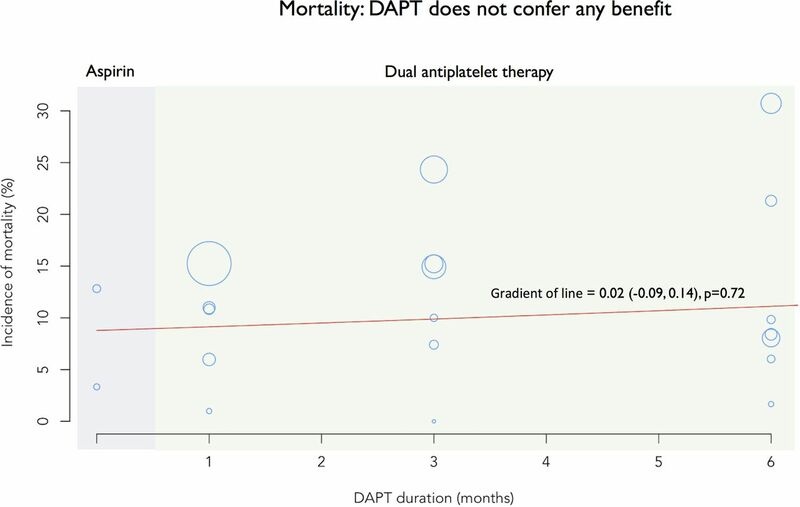 The red line denotes the gradient (β), with there being of no benefit in terms of DAPT over aspirin for mortality. DAPT, dual antiplatelet therapy. Metaregression showing the relationship between stroke and antiplatelet strategy. The x-axis shows DAPT duration, including aspirin monotherapy on the far left (blue panel). The y-axis shows the incidence of stroke. Individual studies are represented by circles, with study size weighting giving varying sizes. 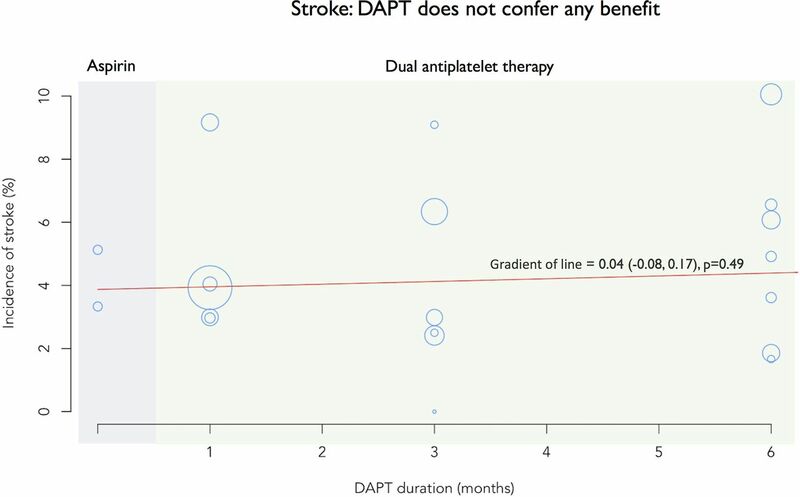 The red line denotes the gradient (β), with there being of no benefit in terms of DAPT over aspirin for stroke. DAPT, dual antiplatelet therapy. Metaregression showing the relationship between bleeding and antiplatelet strategy. The x-axis shows DAPT duration, including aspirin monotherapy on the far left (blue panel). The y-axis shows the incidence of stroke. Individual studies are represented by circles, with study size weighting giving varying sizes. 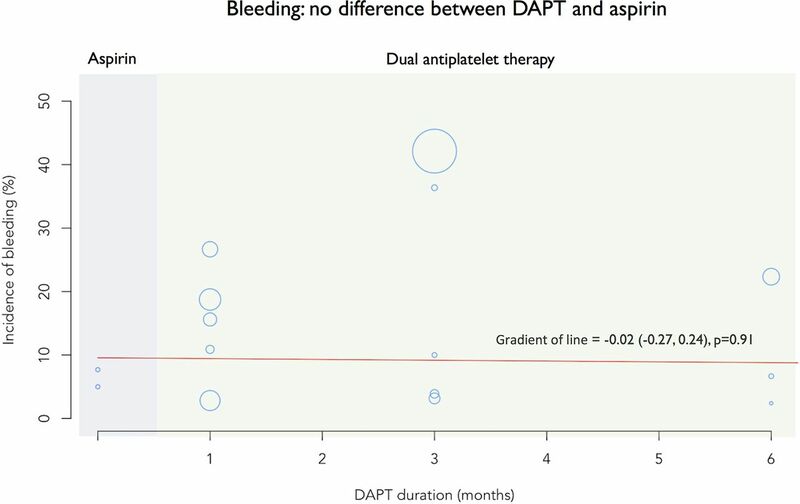 The red line denotes the gradient (β), with there being of no statistical difference between aspirin and DAPT for bleeding. DAPT, dual antiplatelet therapy. In this study, we have found that: (1) there is large variance in the antiplatelet regimens used by different TAVI operators, with the majority of operators relying on personal or institutional policies rather than guideline recommendations; (2) compared with DAPT, aspirin monotherapy demonstrated similar protection against stroke; and (3) if DAPT is preferred, 1 month appears to be sufficient. The meta-analysis presented is, by some margin, the largest addressing the question of the optimal antiplatelet strategy following TAVI. In this field, where adequately sized, high-quality RCTs are currently lacking, this represents the most comprehensive analysis to date to inform clinical practice. In addition to providing the largest and most contemporary data available, our study has further unique aspects. First, we have performed a structured survey that highlights the patterns of antithrombotic use by TAVI operators in clinical practice, and the rationale behind this. Furthermore, we have gone on to perform a metaregression using antiplatelet strategy as a moderator. This additional analysis confirms that prolonged DAPT had no effect on clinical outcomes, and helps give clinicians further confidence in limiting the duration of DAPT or using a single antiplatelet strategy for their patients. Current guideline recommendations on antithrombotic therapy after TAVI are not uniform, and the strength of recommendations is not strong. The 2014 and 20178 9 American Heart Association/American College of Cardiology (ACC) guidelines on valvular heart disease suggest aspirin lifelong plus clopidogrel for 6 months ‘may be reasonable’, corresponding to a strength of recommendation class of IIb. The level of evidence is classified as level C, indicating the lowest possible level of certainty (very limited populations evaluated, only consensus opinion of experts, case studies or standards of care). The 2017 ACC Expert Consensus Document45 on the care of patients after TAVI states that the current standard antithrombotic therapy after TAVI should be clopidogrel 75 mg orally daily for 3–6 months with oral aspirin 75–100 mg daily lifelong. The European Society of Cardiolog y guidelines on valvular heart disease7 do not make a specific recommendation for the duration of DAPT after TAVI, but simply state that a combination of low-dose aspirin and a thienopyridine should be used early after TAVI, followed by aspirin or a thienopyridine alone. The definition of ‘early’ is not provided, leaving this open to interpretation by clinicians. Position statements from the Canadian Cardiovascular Society (CCS)46 (DAPT for 1–3 months) and American College of Cardiology Foundation (ACCF)/American Association for Thoracic Surgery (AATS)/Society for Cardiovascular Angiography and Interventions (SCAI)/Society of Thoracic Surgeons (STS)47 (DAPT for 3–6 months) give similar recommendations. Clinicians treating patients after TAVI are therefore provided with guideline recommendations that are not uniform across guideline bodies, are not specific with regard to the duration of DAPT recommended within individual guidelines and are made with the lowest levels of recommendation and weakest strength. This is a reflection of the paucity of evidence available in the field, and has likely contributed to the heterogeneous patterns of antithrombotic therapy clinicians are using. For the first time, in this study, we present contemporary, real-world clinical practice data with regard to antiplatelet prescribing following TAVI, and the rationale behind treatment choices made by clinicians. This has provided an insight into how treating clinicians chose to interpret the available data, along with guideline recommendations and their own clinical judgement to inform the choice of antithrombotic therapy for patients undergoing TAVI. The majority of the clinicians surveyed do not base their decisions on antithrombotic regimens after TAVI on guideline recommendation (only 13.3%); rather, the vast majority base their decisions on personal preference or local institutional policy. This may be a reflection of the variance in recommendations between different guideline bodies, as well as the weak strength of recommendation and low class of evidence. The guideline recommendations are in turn a reflection of the absence of strong randomised data in the field. The most commonly used duration of DAPT in our structured survey was 3 months (57% of respondents), while only 5% of centres used a shorter term policy (1 month). The majority of centres used DAPT after TAVI. The most common duration was 3 months with only 5% of centres using 1-month DAPT. This study demonstrates that there was no additional benefit of durations of DAPT longer than 1 month with regard to the prevention of stroke or death. There was no difference in bleeding rate between DAPT durations in this analysis. This may be a reflection of the heterogeneous definitions of bleeding between the studies. Other studies have demonstrated the clear bleeding risk of prolonged DAPT.34 Although these studies did not include patients undergoing TAVI, their findings are likely to be applicable to the TAVI population given the comparatively high prevalence of renal impairment, underlying anaemia, frailty and other comorbidities that increase the propensity to bleed. It is therefore reasonable to conclude that should DAPT be preferred, the duration should be limited to 1 month. Guidelines recommend DAPT after TAVI, but as described above these are empirical recommendations based largely on expert consensus view. In the absence of RCT data, the recommendation for DAPT over aspirin monotherapy has been founded on extrapolation of data advocating DAPT following implantation of drug-eluting coronary stents. However, there are fundamental differences in the thrombotic tendencies of TAVI valves and coronary stents, which limit the acceptability of this assumption. Important differences include the increased size and the bioprosthetic nature of TAVI valves. Furthermore, the advanced age, frailty and comorbidity of the current cohort of patients undergoing TAVI make bleeding complications more likely. This analysis suggests DAPT may not be necessary. Aspirin monotherapy was found to be equivalent to all durations of DAPT in terms of stroke prevention and death. This is consistent with two small randomised trials26 42 (total of 199 patients) which have compared DAPT with aspirin monotherapy, as well as two non-randomised studies28 33 (total of 463 patients). When considered alongside our analysis of 11 781 patients, there appears to be a consistent signal that aspirin monotherapy is as effective as DAPT at preventing stroke. Recent data have shown that subclinical valve leaflet thrombosis is more common after TAVI than surgical aortic valve replacement with bioprosthetic valves,49 and that this may lead to an increased risk of stroke. Therefore, there is interest in the potential role of oral anticoagulants, particularly non-vitamin K oral anticoagulants (NOAC) for antithrombotic therapy after TAVI. The role of NOACs after TAVI is being evaluated in prospective RCTs (ClinicalTrials.gov Identifier: NCT02664649) and these data may inform future guideline recommendations regarding antithrombotic therapy after TAVI. To limit the possibility of a false positive result, we have used a random effects analysis. However, it remains unclear how the number of studies, the relative weights of each study, the extent of heterogeneity between studies and the potential for aggregation bias all influence the probability of any metaregression producing false positive or false negative results. We assessed publication bias using a Funnel plot, but accept that this does not completely exclude the possibility of publication bias. Therefore, as with any other meta-analysis, any conclusions from this study should be interpreted with this uncertainty in mind. The number of patients treated with aspirin monotherapy was much lower than those treated with DAPT, probably as a reflection of the current guideline recommendations. One could argue that this may limit the comparability of these cohorts. However, the event rates seen in the monotherapy groups are similar to the DAPT groups, and furthermore short durations of DAPT were as safe and effective as longer durations of DAPT; this provides support to the idea that aspirin monotherapy may be sufficient. There was no uniform definition of bleeding. This may have masked any effect longer DAPT durations may have had on bleeding. A further explanation for the lack of effect of DAPT on bleeding may lie in the fact that some TAVI trials have excluded patients with recent bleeding events or at particularly high risk for bleeding. This incurs an inevitable selection bias which may have affected our results. The lack of effect of DAPT on bleeding should therefore be interpreted with caution. Aspirin monotherapy appears to be as safe and effective as DAPT.
. Guidelines on the management of valvular heart disease (version 2012): the joint task force on the management of valvular heart disease of the European Society of Cardiology (ESC) and the European Association for Cardio-Thoracic Surgery (EACTS). Eur Heart J 2012;33:2451–96.
. Aortic Valve Replacement in Redo-Scenarios: A Comparison Between Traditional Aortic Valve Replacement (TAVR) and Transapical-TAVR from Two Real-World Multicenter Registries. J Heart Valve Dis 2015;24:669–78.
. Antiplatelet and antithrombotic treatment after transcatheter aortic valve implantation - comparison of regimes. J Invasive Cardiol 2013;25:544–8.
. Percutaneous implantation of the CoreValve self-expanding aortic valve prosthesis in patients with severe aortic stenosis: early experience in Spain. Rev Esp Cardiol 2010;63:141–8. Contributors All authors fulfil the International Committee of Medical Journal Editors (ICMJE) recommendations for authorship. Conceived and designed the research: YA, SS. Performed statistical analysis: YA, MSS, JPH, AA. Acquired the data: YA, OD, MSS, CC, AA, AF, NS, BA, GK, GM, IM. Drafted the manuscript: YA, OD, CR, CC, RP, RJ, DF, JM, SS. Made critical revision of the manuscript for key intellectual content: YA, OD, CR, JPH, MSS, CC, DF, JM, GM, IM, SS. Funding This work was supported by the National Institute of Health Research Biomedical Research Centre at Imperial College London. Data sharing statement The corresponding author agrees to share the source data upon reasonable request.